Over the last four days, we have covered a lot of information, but we hope that it will prove to be a useful insight for anyone who is seriously considering jumping in, with one foot or the other, or maybe even both feet together and plunging in to the realms of SLI. In general, you will not be disappointed, and we feel that NVIDIA will still continue to improve SLI. We recently reported that NVIDIA's next-generation part might not have the same flexibility as the current GeForce 6-series, where NVIDIA's board partners offer an SLI solution for a mere £270 in the form of GeForce 6600 GT. Of course, that is not factoring in the cost of a CPU, motherboard, memory of even power supply. Until now we haven't mentioned power supply units. However, this is a part of the system that is certainly not one to be overlooked. In fact, we would go so far as to say that it is one that cannot be overlooked. If you do not buy a power supply with adequate power and enough current on the rails, especially the 12.0v rail, you will come unstuck and be greeted with no end of problems. 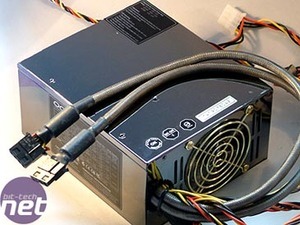 When choosing a power supply, we recommend buying a good quality branded power supply. Throughout our initial investigations in to SLI and how it works, we went about testing a number of power supplies. We tested a reasonably old power supply from HEC, rated at 475W, which was not up to the task of powering a pair of GeForce 6600 GT’s, let alone a pair of GeForce 6800 Ultra's. The problem is that there was not enough current available on the 12.0v line, with a mere 17A at its disposal. We also tested a power supply from Hiper, the 475W Type-R. This faired much better than the HEC unit, and we were able to power two GeForce 6800 Ultra's and an FX-55 without a problem. However, the problem arose when we tried to overclock the system. We started to experience instabilities during game play when we overclocked our pair of GeForce 6800 Ultra's beyond their stock speeds. In general the Hiper Type-R 475W was up to the task on GeForce 6600 GT and GeForce 6800 Std SLI solutions. It also ran fine with both GeForce 6800 GT and GeForce 6800 Ultra SLI solutions, providing you did not want to increase clock speeds above the stock settings. We feel that this is because the unit has two 12.0v lines rather than a single line with a high current. Finally, we tested OCZ's PowerStream 520W. 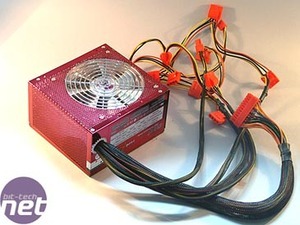 This was not a PSU with PCI-Express connectors, but it does have a pair of dedicated power lines for powering AGP video cards. 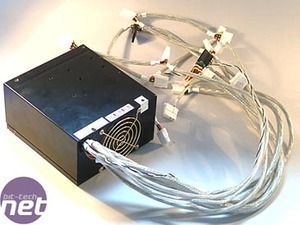 We linked one of these to each video card, along with an additional connection to one of the main power rails coming out of the unit. This allowed us to have a dedicated power line to each video card, while using one of the main lines as a backup if the video cards required more power than a single plug could deliver. The unit also has adjustable 3.3v, 5.0v and 12.0v rails, allowing you to tweak the PSU's lines to keep the values as close to 3.3, 5.0 and 12.0 volts respectively. We tweaked them on initial setup, but then did not have to touch them again. We managed to overclock both the video cards and processor without hitch. This is down to the fact that the power supply has a higher current available to it on the 12.0v line, allowing for video card stability when it is needed most. We recommend that you factor in the cost of a decent PSU in to your upgrade costs, because you’re going to need a capable unit. One that can deliver the required power when it is needed most. 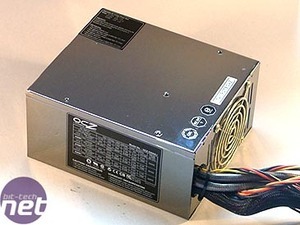 If you are looking at buying either a GeForce 6600 GT or a GeForce 6800 Std SLI solution, we recommend that you consider buying a high-quality power supply with at least 450W, with high current available on the 12.0v line. Please take note that a single 12.0v line with high current is better than multiple 12.0v lines with lower current. As a rough yard stick, our OCZ PowerStream 520W power supply has 33A on it's 12.0v line. If you are considering a GeForce 6800 GT or GeForce 6800 Ultra SLI solution, we recommend that you buy the best power supply that you can afford. Make sure that it is rated at over 500W, in real terms, rather than a number that the PSU manufacturer plucked out of the sky. Picking up a cheap PSU will cause you no end of problems, so spend wisely and make sure that you factor it in to the cost. It should be one of the first things on your list, not one of the last like is often the case.